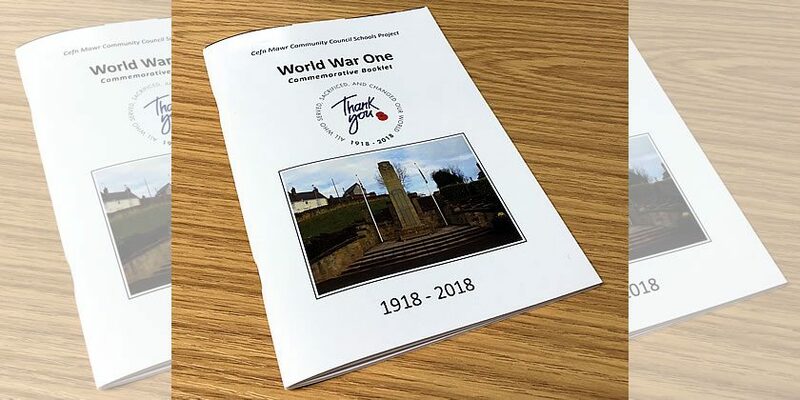 The above substantial booklet has been issued by the War Memorial & Recreation Group Trust committee of Cefn Community Council to commemorate the 100th anniversary of the end of World War One. 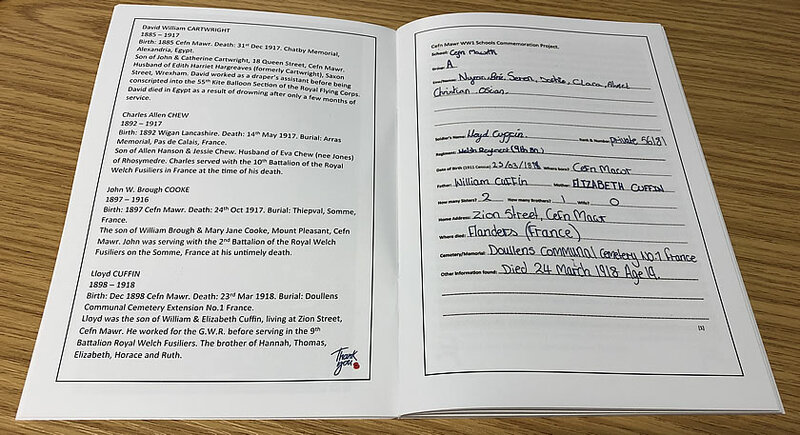 As well as local schools, various ex servicemen, historians and volunteers have worked together to research 130 recorded people on the Cefn Cenotaph who fell during the war, or following the end of the war due to the injuries they sustained. 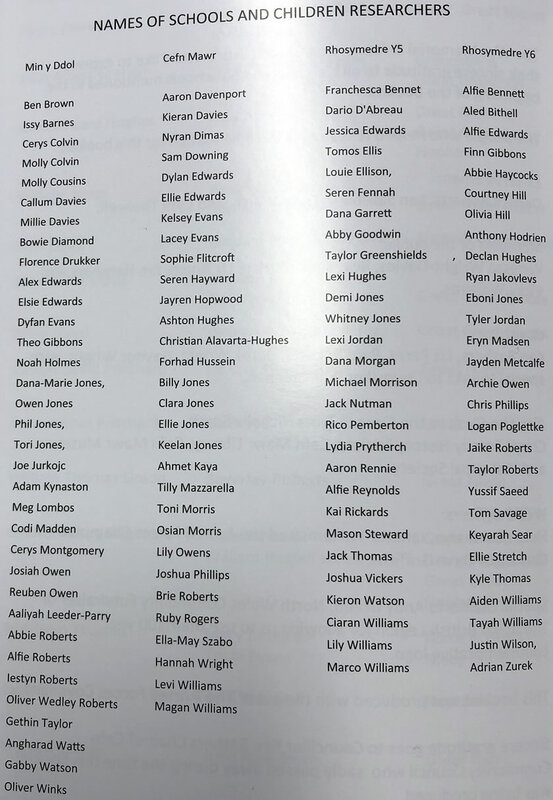 The booklet contains the written research from primary pupils of Ysgol Cefn Mawr, Ysgol Min Y Ddol and Ysgol Rhosymedre. Research techniques included contacting different regiments, examining census records and the War Records Department at the Ministry of Defence. We spoke with Cllr Derek Wright about the project, and asked him why he felt the project was important: “My original idea was to try to get the children in our community to be aware of the sacrifices the young men made 100 years ago, as I still remember projects I worked on when I was in primary school to the day some 55 years after. “I was hoping if the present school children do the same these people would live on in their memories for a considerable time into the future, particularly as we lost so many from what I consider a small community. “We wanted to involve all pupils from the 4 primary school, unfortunately due to staffing issues only 3 could, that meant each school researched around 40 young men each. “Our original idea was to just do a booklet similar to our community news and stage some events, with particular reference to involving the schools, ex-service men and local volunteers and for us through our research to find as many living relatives of the fallen from that awful conflict and for them to lay crosses on be have of their forefathers. “We were advised there was funding available from the MOD Armed Forces Covenant Trust by WCBC Officers. We applied for a grant of £9000 and were successful, this has enabled us to do everything on our one time wish list which has included sending children from 5 schools to the National Arboretum in Lichfield and to host discos for all the children involved in the research. 5 Standing Soldiers silhouettes have also been purchased with the grant, one for each primary school and one to go near the local Cefn Mawr Cenotaph.